Seems with Zero on his way out the door, Bandai is looking to the next D-Arts release in America: Full Armor X. I've received word from Adam Newman of Bandai that the figure is indeed headed stateside, due for release in October. Pre-orders should show up soon, closer towards the end of the month. Yes, Full Armor X is releasing this month in Japan, but the localized version offers a more accessible venue to obtain it within North America. No need to worry about those nasty import fees! Full Armor X is an entirely new figure, and not just a set of replacement parts. All joints are interchangeable with the original D-Arts X, in case you want that incomplete armor look. Parts/joints can even be exchanged with the Zero for even stranger results. Of course, Full Armor X comes with his own accessories: two hand parts, shot effects and charge blast effects. Somehow I'm not excited at all. Because honestly they are not the best figures, like not all X and Zero are the same, they each have different flaws. Like one will have paint mess ups, loose joints, parts not done right that they fall off easily. And Zero, his greatest flaw that his hair can break off too easily. *BEWARE* But it's like you have pick the right one when purchasing in person, but purchasing online it's like a gamble in hopeing you'll get a good one. I can only imagine what flaws the Full Armor X will have. Over all I'm not excited at all, not one bit. If I can garner up the cash, I might get this Full Armor X.
I've always liked X1 and X3's Ultimate Armor look. So wheres the best place to buy all the US versions of these figures? While quality control is a little poor in this line compared to other modern figures, they're a far cry from being horrible. They pose well, they're very accurate to the games, and their scale is fairly big. It's true that Zero's hair joint is horrible, it's way too fragile and nearly impossible to fully repair if it breaks at the base as mine did, but overall I've had a lot more problems with Koto model kit line than Bandai's D-Arts line. Right now I'd say the D-Arts X and Zero figures are probably the best mass produced ones you can get. Like I and first anon said though, the quality control does leave something to be desired, especially considering the price is actually higher than, say, an average figma. I'll buy this for sure. I can't say that my D-Arts X disappointed me, mine is solid and looks great. I still have to pick up the D-Arts Zero figure. My D-Arts X was crazy impressive, so I have zero (pun) reason not to pick this and/or any other D-Arts Rockman stuff that comes out. This might seem like an odd question, but can you take off X's helmet in this model? I have some older Bandai figures and models that have removable helmets, so I was curious about that and what his head might look like on this one (on my others it's mainly gears and such). @ 4th Anonymous down saying his D-Arts X is solid. Even though your D-Arts X is solid, look all around it, check for paint errors like drips, smudges and etc. Like on the light blue on his helmet, his eyes, his chest, his back chest, i'm pretty sure you'll find an error somewhere. 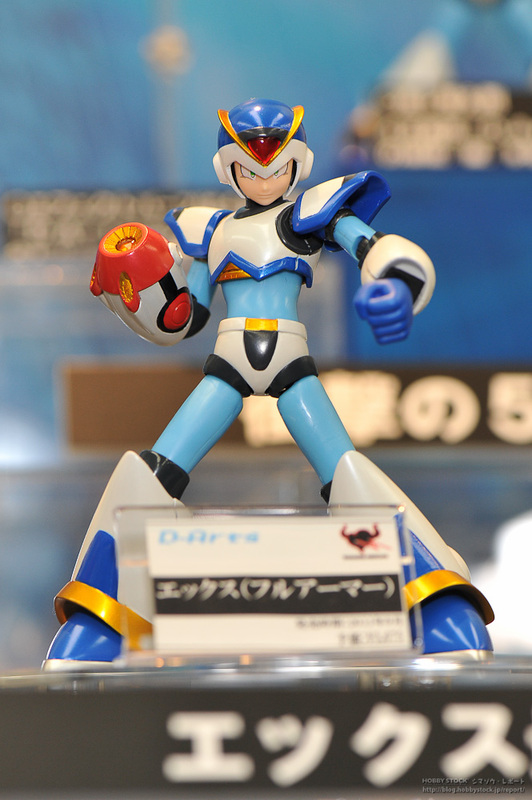 Not all D-Arts X are perfect or good, only the one(s) in Bandai HQ or stupid Capcom HQ are mint perfect. While the rest of us get messed up here and there ones. Like we pay $34.99-$44.99 for a X with a paint smudge on the side of his helmet. Or Zero with a loose hip joint. A friend of mine also ordered a D-Arts Zero and when he got it, it had a complete error on Zero's calm face. The error was that little black line below the eyes, the error was it was way above in the eye, like right below his eye iris. (coincidence thats called iris too) but it was right in his eye as Zero's other eye was correct. to others, a error here and there won't be a be a big deal as they say, but you know its there, and you can't ignore it, its like having a brand new car and theres a little white scratch on it, it bugs you cause you know its there. -Figures are more sensible/prone to scratches than Revoltechs/Figmas,etc. (This was my fault but keep it in mind). -Paint issues here and there. -Some of their joints are too weak. X´s arm swivel joints are very tiny so if you pose him long enough with the charge shot without added support, it will eventually snap. This happened to both of the arms on my X.
Im skipping Zero for now cuz im low on money but i im still picking up Armor X nexth mont, even tough i know its gonna have the exact same delicate joints. I like the figures that much.